November 14, 1967: Patent # 3,353,115 is issued to Theodore Maiman. He was born in 1927 in Los Angeles, California. His father was an electrical engineer and inventor. Ted helped his father with experimentation in their home laboratory after the family moved to Denver, Colorado. By the time he was a teenager, he was earning money by fixing electrical appliances and radios. After high school, Maiman was employed by the National Union Radio Company at the age of 17. He served in the US Navy during World War II and then earned his undergrad degree in Engineering Physics from the University of Colorado. He went on to Stanford University and received both his masters and PhD degrees from there. Maiman’s doctoral thesis involved microwave-optical measurements of fine structural splittings in excited helium atoms and was achieved under the direction of Willis Lamb, a Nobel Laureate in Physics, awarded in 1955. While conducting research, Maiman also devised laboratory instrumentation for Lamb’s experiments. Maiman’s thesis experimentation was instrumental in his development of the laser, which is what the patent awarded on this day was for. In 1956, Maiman began working at the Atomic Physics Department of the Hughes Aircraft Company (later HRL Laboratories) where he led the ruby maser redesign project for the US Army Signal Corps. He was able to reduce it from a 2.5-ton cryogenic device to four pounds and still improve performance. Because of his success in this venture, he was able to convince management to use company funds for research into his laser project. On a total budget of $50,000 he was able to design a laser using a synthetic ruby crystal. He was able to demonstrate this first laser (which other scientists had refused to believe would work) on May 16, 1960. He submitted this for patent and finally received that patent on this day. A laser is a light-emitting device which works via optical amplification based on the stimulated emission of electromagnetic radiation. The term is an acronym for “light amplification by stimulated emission of radiation” and is much easier to say. Lasers emit light coherently which makes them different from other light sources. A ruby laser is a solid-state laser using a synthetic ruby crystal as its gain medium and emits pulses of visible light at a wavelength of 694.3 nm – a deep red color. 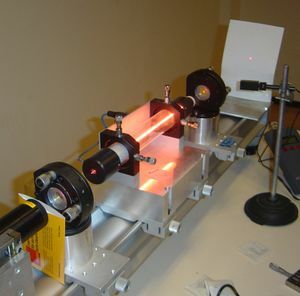 One of the major applications of ruby lasers is for range finding. They were the standard for military use by 1964. They are rarely used in industry because of low efficiency and low repetition rates. Their use is in decline as better systems have been invented. Maiman went on to win many awards both during his life and posthumously. He changed the world with his discovery and had been given accolades appropriate to his ingenuity. He died in 2007 at the age of 79 of a rare disease, systemic mastocytosis. Also on this day: Nellie Bly – Woman Journalist – In 1889, Nellie Bly left for her trip around the world. The Big Barbecue – In 1957, a Mafia meeting was held in Apalachin, New York. Sugar and Spice – In 1997, Reena Virk is murdered. Crash – In 1970, Southern Airways Flight 932 crashed in West Virginia. March 22, 1960: Arthur L. Schawlow and Charles Townes receive a patent for the laser while working for Bell Labs and change our lives dramatically. LASER is an acronym rather than a noun. It stands for Light Amplification by Stimulated Emission of Radiation. It is a device that creates and amplifies a narrow intense beam of coherent light. The trick is to find the right atoms – which emit the radiation. Atoms are used from crystals like rubies and garnets as well as gases or liquids. These atoms are stimulated or excited as well as focused and then used in a variety of applications today. The output of lasers are varied. They can be a continuous constant-amplitude and called CW or continuous wave. Some of these can produce visible light and can do so for a very short period of time – a few femtoseconds. That word means one quarrillionth of a second or 10-15 which is also one millionth of one billionth of a second. So a very short time. There is also a method of use called Q-switching, another method is modelocking, and there is also pulsed pumping. Lasers are useful in industry, medicine, communications, scientific research, and holography. You use lasers every day when items are run across a bar scanner or when you print with a laser printer. When you listen to a music CD or run a data CD the reader uses laser technology. DVDs also use this focused light. Also on this day, in 1989 Clint Malarchuk got his throat slit during a hockey game.